Washington, D.C. – A new Department of Defense Inspector General’s report, released last week, has left Americans stunned at the jaw-dropping lack of accountability and oversight. 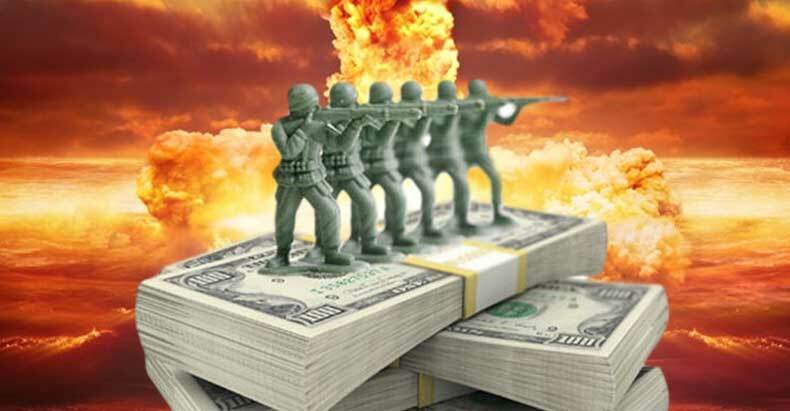 The glaring report revealed the Pentagon couldn’t account for $6.5 trillion dollars worth of Army general fund transactions and data, according to a report by the Fiscal Times. The Pentagon, which has been notoriously lax in its accounting practices, has never completed an audit, would reveal how the agency has specifically spent the trillions of dollars allocated for wars, equipment, personnel, housing, healthcare and procurements allotted to them by Congress. Beginning in 1996 all federal agencies were mandated by law to conduct regular financial audits. However, the Pentagon has NEVER complied with that federal law. In 20 years, it has never accounted for the trillions of dollars in taxpayer funds it has spent, in part because “fudging” the numbers has become standard operating procedure at the Department of Defense, as revealed in a 2013 Reuters investigation by Scot Paltrow. The Defense Finance and Accounting Service (DFAS), the behemoth Indianapolis-based agency that provides finance and accounting services for the Pentagon’s civilian and military members, could not provide adequate documentation for $6.5 trillion worth of year-end adjustments to Army general fund transactions and data. While there is nothing in the IG’s report specifying that the money has been stolen, the mere fact that the Pentagon can’t account for how it spent the money reveals a potentially far greater problem than simple theft alone. For every transaction, a so-called “journal voucher” that provides serial numbers, transaction dates and the amount of the expenditure is supposed to be produced. The report specifies that the agency has done such a poor job in providing documentation of their transactions, that there is no way to actually know how $6.5 trillion dollars has been spent. Essentially, the government has no way of knowing how the Pentagon has spent the trillions of taxpayer dollars allocated by Congress for national defense. In turn, employees of the DFAS were routinely told by superiors to take “unsubstantiated change actions” commonly referred to as “plugging” the numbers. These “plugs” – which amounted to falsifying financial records – were then used to create the appearance that the military’s financial data matched that of the U.S. Treasury Department’s numbers when discrepancies in the financial data couldn’t be accounted for, according to the Reuters investigation. “For two decades, the U.S. military has been unable to submit to an audit, flouting federal law and concealing waste and fraud totaling billions of dollars. Linda Woodford spent the last 15 years of her career inserting phony numbers in the U.S. Department of Defense’s accounts. While many of the problems occurred due to bookkeeping errors rather than actual financial losses, the DFAS has failed to provide the necessary tracking information essential to performing an accurate audit of Pentagon spending and obligations, according to the IG’s report. The Pentagon has a chronic failure to keep track of its money – how much it has, how much it pays out and how much is wasted or stolen. Adding to the appearance of impropriety is the fact that thousands of documents that should be on file have been removed and disappeared without any reasonable explanation. DFAS “did not document or support why the Defense Departmental Reporting System . . . removed at least 16,513 of 1.3 million records during Q3 FY 2015. As a result, the data used to prepare the FY 2015 AGF third quarter and year-end financial statements were unreliable and lacked an adequate audit trail,” according to the IG’s report stated. The accounting errors and manipulated numbers, though obviously problems in their own right, highlight a far greater problem for the Defense Department than only bad recording keeping and wasteful spending habits. In reality, they are a representation of the poor decision-making, and lack of oversight and accountability that plague our nation’s government as a whole. While the Department of Defense can’t account for $6.5 trillion dollars of taxpayer funds, in 2014 there were 47 million people, including over 15 million children, living in poverty in the U.S. – %15 of the U.S. population, which is the largest total number in poverty since records began being kept 52 years ago. Please share this story if you are appalled by the fact that there are Americans that are homeless and hungry, including U.S. combat veterans — while the government is unable to account for $6.5 trillion dollars of taxpayer money.